Why All This Fuss About Pierre Viret? Faith for all of life simply isn't something new under the sun. 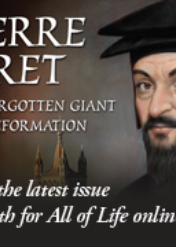 Faithful Christians passed this way before: it was present in the very midst of the Reformation, it rubbed shoulders with the great Reformers, it was recognized (in the person of Viret) as a highly-respected, compelling aspect of the recovery of Biblical faith in the sixteenth century. Viret’s observations, though over four centuries past, are as timely as if he were peering through a window to our modern age. His timeless and extraordinary wisdom unmask the accepted political corruption of the present day. 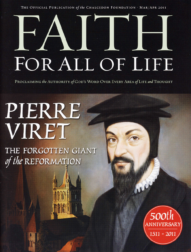 Pierre Viret was undoubtedly (with Martin Luther) one of the finest popularizers of the Christian faith in the sixteenth century. But his deep concern for the spiritual needs of the common people never led him (as is all too common today) to debase the content of his theological teaching. Christian leaders and political conservatives have sounded the call back to a constitutional republic. But unless this republicanism is built firmly on the Christian civil order defined by Holy Scripture, it will fail. The portrait is an excellent introduction to the word-portrait of Viret drawn up by Jean-Marc Berthoud in this handsomely produced little book (just 85 pages, not counting the appendix). If illiteracy, evolutionism, statism, and humanistic mind control are the disasters of the schooling we bravely avoid, what other sets of ruins can we consider and rescue ourselves and others from, for God’s glory? Christians will be obligated to propose and practice godly solutions in new areas.